These Easter Bunny Cupcakes made with Reese's Peanut Butter Cups, Tootsie Rolls, Sweet Tarts, and Whoppers might just be the cutest cupcakes I have ever seen! 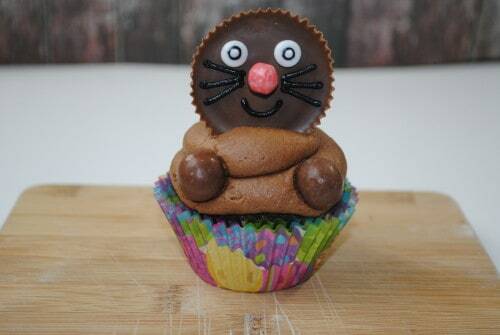 Yesterday I posted those adorable Peek-a-Boo Peeps Easter Cupcakes. Well, today I have another super cute Easter cupcake recipe for you – and this one is bunny themed as well! 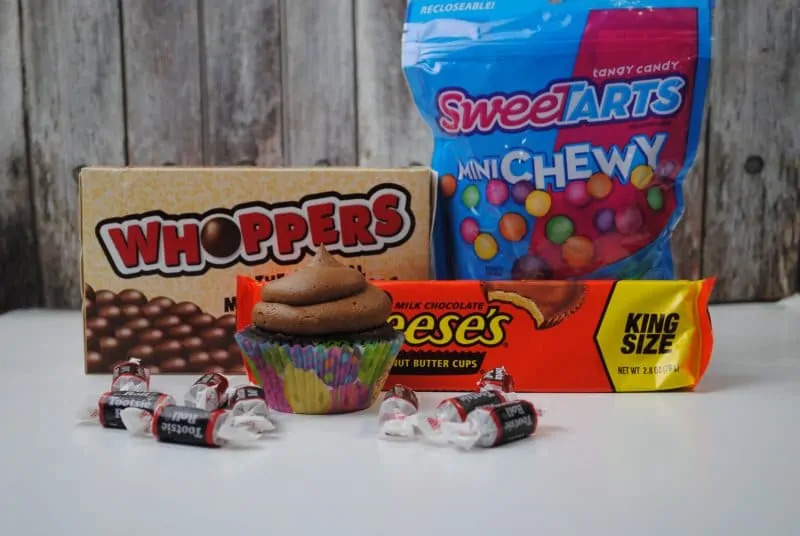 Now you will need to stock up on candy to make these babies as the bunnies are made out of Reese's Peanut Butter Cups, Whoppers, Tootsie Rolls, and Sweet Tarts. Holy candy overload! 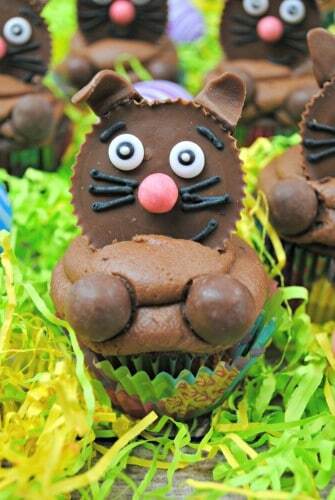 Below I have the recipe lists and instructions for the cupcakes, the frosting, and building the bunny. If you would like to take a shortcut, you can totally use boxed chocolate cake mix and pre-made icing to make the cupcakes. Your call! While these chocolate bunnies look like they took a lot of skill to make, they really are easy. Let's take a look how we put them together, step by step. Simply use your white and black decorating gel to draw on the eyes (or use pre-made candy eyes). Then use the black decorating gel to “glue” on a Sweet Tart Chewy candy as the nose and add details like a smile and whiskers. Place Whoppers into the frosting to make the bunnies hands. Place the peanut butter cup onto the frosting. Use a rolling pin to flatten Tootsie Rolls and cut out the shape of bunny ears. Pop the ears in the fridge to harden for a minute while you melt a bit of chocolate in your microwave. Then, use the chocolate as “glue” to attach the ears to the top of the bunny's head. That's it! Your bunnies are ready to be enjoyed! Looking for more fun and easy Easter desserts? You will love these no-bake rice krispie nests and this delicious bunny bait snack mix! Easter Bunny Cupcakes made out of Reese's Peanut Butter Cups, Tootsie Rolls, Sweet Tarts, and Whoppers! Using a medium bowl, mix together the dry ingredients. Set aside. On low gradually mix in the dry ingredients with the wet and mix until combined. In a large mixing bowl with whisk attachment, add in all ingredients and mix until combined. If “rocks” appear add in another tablespoon of heavy whipping cream. When you have stiff peaks, stop mixing. 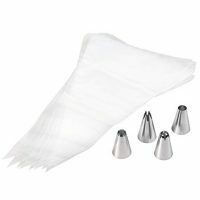 Add frosting to piping bag fixed with a round tip and frost cupcakes. 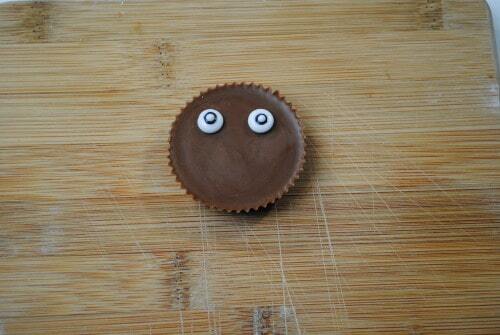 Using white decorating gel, draw a dot for the base of each eye on the peanut butter cups. Then, add a small black dot for the pupal using black decorating gel. Using the white decorating gel again, pipe on a tiny white dot in the center of the pupil. 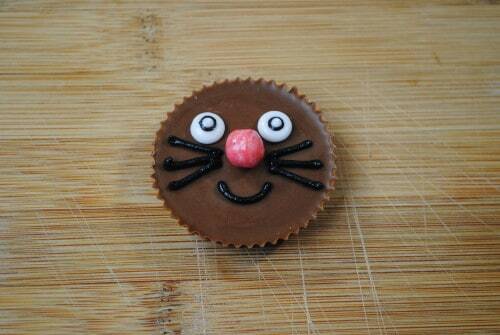 Use black decorating gel to attach a Sweet Tart in the center of each peanut butter cup as the nose. Continue with black decorating gel, drawing on whiskers and a smile (eyebrows are optional). Set bunny faces aside to allow decorating gel to dry. Place Whoppers into the frosting on either side to form the bunny’s hands. 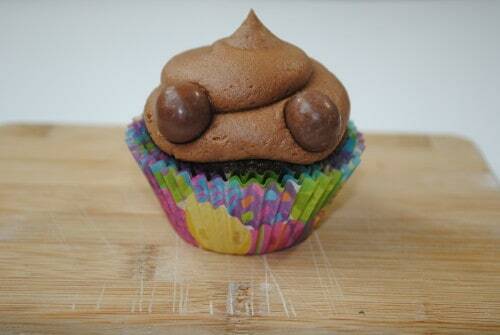 Place peanut butter cups on cupcakes. Use a rolling pin to flatten Tootsie Rolls. Use a knife to cut into ear shape. Place ears into the freezer for 5 minutes to harden. Melt chocolate in microwave by heating for 1 minute, stirring, then heating in additional 15 sec increments, stirring in between, until completely melted. Remove ears from freezer, bend into desired shape, dip bottom into melted chocolate, and place on the top of the peanut butter cup. You can use ready-made candy eyes instead of making the eyes with the decorating gel. These are really cute cupcakes. I will have to pin for next Easter. Thanks for the creative recipe! These are adorable and what a super idea! I would love to make these and eat them too! These are so cute. We love cup cakes. These look delicious. Oh my gosh these are adorable!! And it’s a recipe that doesn’t use a box mix! Double score!! This is a seriously value-added cupcake! You get a peanut butter cup, skittles in addition to the cupcake! These would be good for kids to make.